So, thanks to Jason Zapata Wordsmith‘s constant badgering, I finally picked up the book that started it all for him; The Sword of Shannara by Terry Brooks. He’s been telling me for years about the series and I finally broke down and bought it and then I started to read. The book is great and as I didn’t just purchase one book, I purchased the trilogy as a whole, so I will be reading the rest. But as I started reading, I couldn’t help but think of the world of the book that started it all for me, The Hobbit. Mr. Brooks has done an amazing job creating his own tolkienesque world. The two worlds are not completely different, his races are as in depth and the histories are just as complete. Like I said I have the trilogy and I’m only one book in, so I won’t completely try to make the official comparisons between the worlds of Mr. Brooks and Mr. Tolkien. The Sword of Shannara, is an amazing read. I loved the book. You feel for Flick and Shea, you understand the honor of Balinor and Hendel. The elves Durin and Dayel are easily, two of the most likable characters in the book. That is until you get to Panamon Creel and Keltset, who are by far two characters that in their relatively short time on the page, leave a lasting impression. 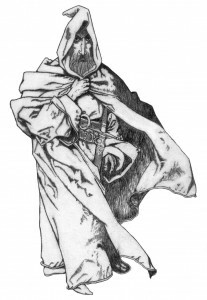 Menion is by far the character who grows the most within the pages of the book. And last but certainly not least is Allanon. He is the Gandalf of this story. 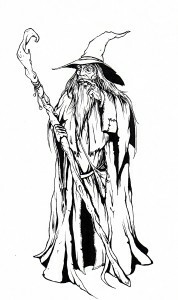 By that I don’t mean to say he is a wizard, as Allanon is himself a druid, but Gandalf in the Hobbit is the glue that gets the party together and gets them on their way, and the wisdom he imparts shows itself when the party gets into trouble when he is away. Allanon is the same character in this book. Like Gandalf in The Hobbit, he’s not with the party at all times, but he’s there when it counts and the wisdom he imparts is also with you when you need it. I’m so glad that I have a good friend who won’t rest until I read something truly great and The Sword of Shannara lived up to his hype. Thank you, Wordsmith, thank you. I can see why this was the book that started you on your path as a writer and having read your works for more than a decade, it’s always nice to see where that spark of inspiration first began. 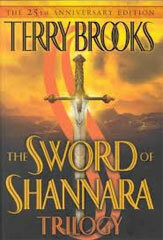 Read the Secret File of technical information and quotes from The Sword of Shannara by Terry Brooks.